There are special industrial environments which make it very difficult to use standard scales to weigh tanks, drums, chemicals and other items. These environments often have aggressive acids or caustics which would quickly destroy a standard industrial scale. The most common of this type of environment is in water and wastewater treatment plants. But there are a wide variety of other situations that are equally severe. These may include chemical manufacturing plants, electro-plating environments, and fertilizer and agricultural manufacturing. If the factory floor is not extremely difficult, it may be suitable to simply specify scales that are constructed from stainless steel. It is important to make certain that the load sensors are also fabricated from stainless steel, instead of aluminum as is often used. 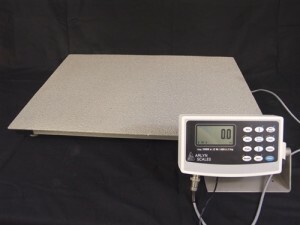 Certain high quality platform scales, such as the Arlyn 3200 Series, may be optionally ordered with stainless steel construction. This type of scale will certainly be suitable in wet or wash down environments. It is even suitable in somewhat more corrosive situations such as brine, or mild acids. It is also possible to optionally order construction from the stainless steel alloy of 316, which is better for certain chemicals. Even this alloy should not be exposed to high concentrations of corrosives. In these situations, a coating must be applied to the stainless steel for appropriate protection. The choice of coating is critical, as it must satisfy a number of requirements. Primarily, it should be able to resist the corrosive environment. It must also be able to bind tightly to the stainless steel of the scale. And it must also be able to resist the wear and tear that a scale will experience as loads are placed onto the platform. An excellent coating material is a polyamine epoxy. This material exhibits excellent overall chemical resistance. It holds up well to both inorganic and organic acids. Even strong caustics will not damage the material. Protection is offered against most solvents. Petrochemicals and alcohol will not present problems. Of course, water and brine are not an issue. Arlyn Series 320-Cor Corrosion resistant scales, the Neptune line, use this type of coating over a stainless steel structure. It is applied using a method that provides a thick layer of epoxy that adheres very well to the scale. For added protection, a super hard grit is added to the epoxy. This material will prevent damaging the coating when heavy loads are placed on the scale platform. It also provides an attractive, non skid surface. Many of this type of epoxy materials will be affected by sunlight exposure. This could cause eventual failure of the coating. The coating used for the Arlyn scales will not be as severely affected, even after many years of exposure. But there will be some discoloration and loss of surface gloss. There will also be some eventual chauking and powdering of the surface. 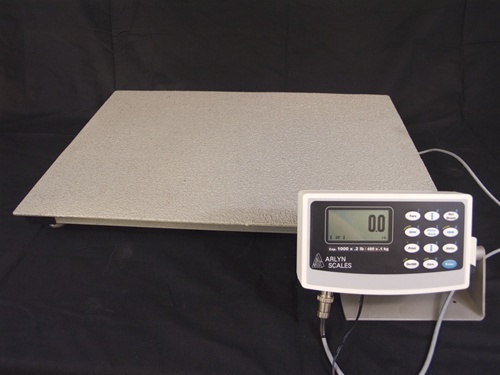 While this coating is generally only used for Arlyn‰Ûªs platform scales, it may also be specially ordered for scales with different sizes and capacities. This includes Large Floor Scales, with platforms ranging in size from 3‰Ûª x 3‰Ûª and capacities of 2500 lb, all the way to very large 6‰Ûª x 8‰Ûª platforms, with capacities exceeding 20,000 lb. As with the platform scales, this coating is generally only applied to scales with stainless steel construction. It is also possible to specially order stainless steel drum scales with the special epoxy coating. The scale ramps should also be constructed from the same material, with the same coating. In all cases, it is important to specify that the load sensors are made from stainless steel. It is not possible to apply the epoxy coating to the load sensors, as it will cause undesirable performance characteristics. For this reason, the load sensors should not be directly exposed to the to the corrosive materials. Instead, they should be positioned internally within the scale. Although they will still be exposed to fumes, they will be protected from direct contact with the corrosives. To minimize the effect of the fumes, the electronic elements on the load cell should be coated with an appropriate compliant RTV material. This coating should be thin, for best mechanical properties, but should avoid pinholes and voids, for the best protection effect.